A sweeping analysis of current research shows that people who eat at least 20 grams of nuts each day are less likely to develop potentially fatal conditions such as cancer and heart disease. New research published in BMC Medicine is highlighting the impressive health benefits from the regular consumption of nuts such as pecans, hazel nuts, walnuts, and even peanuts (which are technically legumes). Eating just 20 grams of nuts each day was linked to a 30 percent reduction in coronary heart disease, a 15 percent reduction in cancer, and a 22 percent reduction in premature death. Nut consumption was also associated with a reduced risk of dying from respiratory disease and diabetes, although these correlations were weaker and involved smaller sample sizes. Those are impressive numbers by any measure. Previous research managed to link nut consumption with a reduced risk of heart disease and “all cause mortality,” i.e. literally any cause of death, but potential associations with more unusual causes of death had not been thoroughly studied. To address this oversight, a research team from Imperial College London and the Norwegian University of Science and Technology pooled together 29 published studies from around the world to conduct the most exhaustive analysis of current research on nut consumption and its associated health benefits to date. Collectively, these studies involved upwards of 819,000 participants, and included more than 12,000 cases of coronary heart disease, 9,000 cases of stroke, 18,000 cases of cardiovascular disease and cancer, and more than 85,000 deaths. Differences between the populations were studied (e.g. differences between men and women, or people with different risk factors), but even accounting for these factors, researchers consistently found that nut consumption could be linked to a reduction in disease. It’s important to point out that correlation is not causation; this study didn’t look into the physiological mechanisms that may account for the dramatic reduction in disease risk. It’s possible, for example, that nut consumption is tied to other types of healthy eating habits (e.g. people who consume nuts may be health-oriented types who eat lots of vegetables and fruits, too). That said, the nutritional value of nuts is hardly a secret. 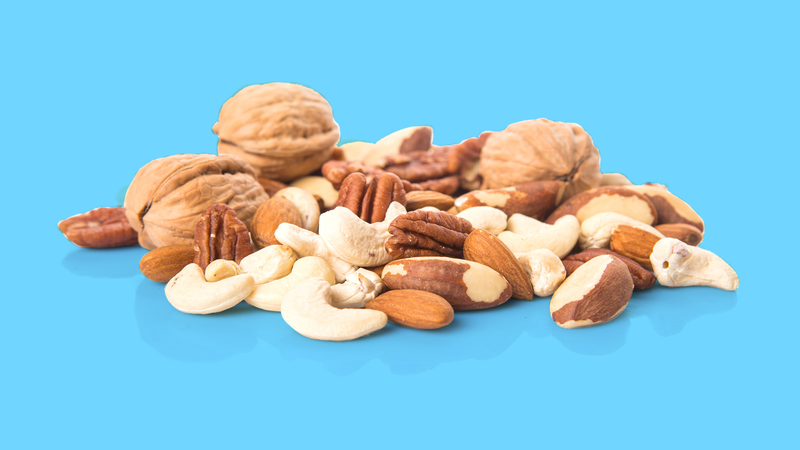 Nuts contain high amounts of fiber, magnesium, and polyunsaturated fats—nutrients that play a key role in cutting cardiovascular risk and reducing cholesterol levels. Sadly, the researchers weren’t able to conclude whether peanut butter offers the same health benefits, but say it’s “possible that the added sugar or salt in peanut butter could counteract any beneficial effects of plain peanuts.” Which brings up a good point: excessive amounts of salt on your nuts may negate some of these health benefits. Also, the researchers found that eating more than 20 grams of nuts each day didn’t improve health outcomes any further, so no need to start binging on nuts.